Have you ever laid down and rolled around on a pile of #4 crushed limestone rock? I have. Don’t ask why. If you have, then you should already possess with a significant amount of certainty knowledge of what a Rumble Roller feels like. 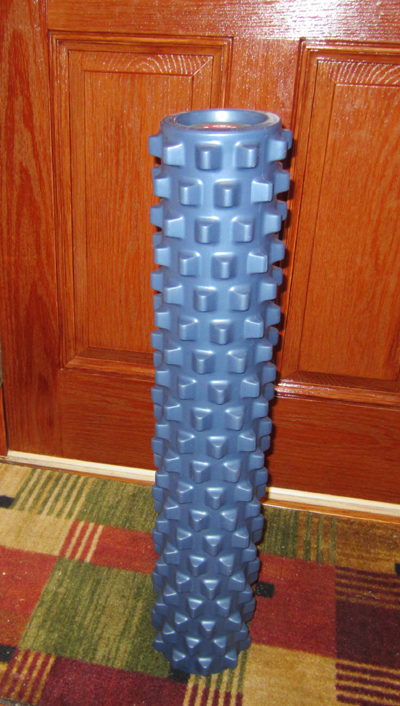 There isn’t much difference between the feel of a Rumble Roller and that of jagged rock gouging your muscles. It’s impossible to become completely comfortable on either. The only differences that I see is that the Rumble Roller is much more portable than a pile of rocks and that when you’re finished with the roller, you aren’t covered in grayish limestone dust. If you were to ever listen to me while I’m in a Rumble Roller session, you might think that I was undergoing slow torture. You would almost be right. Despite my belief that one cannot and should not relax on a bunch of crushed rocks, I do recommend (highly) the Rumble Roller. Let’s back up a minute first. If you have never used a regular foam roller before then it is surprisingly painful. The Rumble Roller takes that pain to a new level, but as painful as it is; it is equally effective at coercing your muscles into flexibility. I am one of the most inflexible people I know. I do not recall having ever touched my toes in my entire life. I still can’t even after 2 years of yoga and stretching. I have made gains over these 2 years and I’m now only 4 inches away from my toes rather than 9.5 when I started. However, in the last couple of weeks since using the Rumble Roller I can sense some flexibility that was previously missing. My starting point at stretches is now closer to my desired ending point and it doesn’t feel like I’m trying to stretch rebar anymore. This could simply be a product of my imagination, but I don’t think so. I purchased the 36″ inch original density model from Amazon. In hindsight, the compact model would probably work just as well for me. It comes with a nice set of instructions on how to properly use it. You don’t just roll around on it like a rolling pin. When it gets really painful you stop on that point. Yes, you heard that right. The goal is to find the position in which it hurts the most and stay there for what seems like an achingly long time. As bad as this sounds, I’ve begun to look forward to my Rumble Roller sessions and I now use it 4 or 5 times a week. This might just be the missing tool that I’ve needed to transform from stick man into Gumby (or at least a crude approximation of Gumby). Next Simple Fuel: Yeah, it’s good!